Is there a housing affordability crisis in Canberra? Housing affordability is a sensitive topic and it can bring out quite heightened emotions during debates. However, without some basic facts that everyone can agree on and relate to, it will be rather difficult to reach any consensus on the issues involved and focus on working out suitable solutions. Here is the evidence as to what the real issue is using the latest Census data. I will go straight to the point: is there a housing affordability crisis in Canberra or not? In short, the answer is ‘Yes, there is an issue’, but it only concerns a relatively small proportion of Canberra population. In particular, as identified in my previous article titled “Deciphering housing affordability for better policies”, the group in question comprises the most vulnerable in our community: low income earners (whatever the underlying causes may be). One obvious characteristic of this group is that its members are not in the position to be buyers of property so rental accommodation is the only choice for them. This narrows the scope of the housing affordability problem quite dramatically. Everyone else, regardless whether renting or buying, is enjoying relatively inexpensive housing at the moment so should not be a primary concern in the debate on housing affordability. For context to this statement, please see my previous series of articles titled Property market mid-year sanity check – Part 1, Part 2 and Part 3. 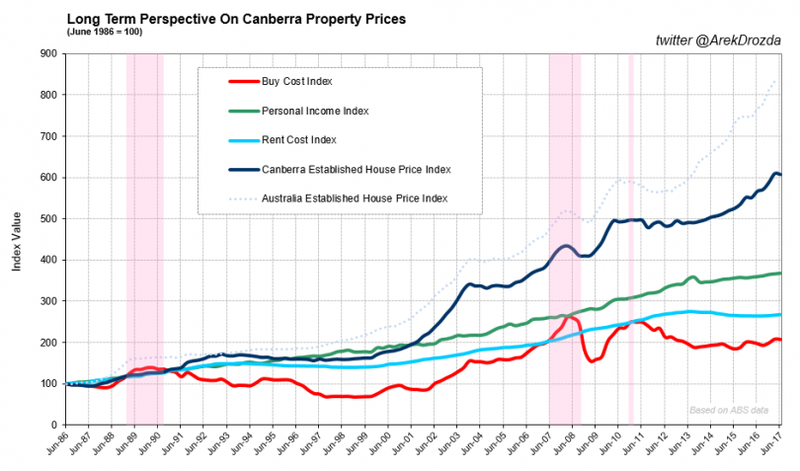 Long term view – property prices Canberra. Once we know who is affected the most by the housing affordability issue, it is easy to define its actual cause. As it turns out, the housing affordability problem is not caused by the lack of cheap housing options in Canberra. Rather, the real cause is the inequitable distribution of affordable accommodation where the benefit of low cost housing goes to the better-off and not necessarily to the most needy. That is the crux of the problem, and not “greedy investors”, “foreigners”, “cost of land”, “inadequate housing supply” or a myriad of other irrelevant causes trashed around in the debates on housing affordability. Let me elaborate on the above statement in more detail, since it appears nobody (not even those researching housing affordability or currently working on solutions) have a grasp of this issue – to my best knowledge, the topic has simply not come up before in any debates despite being so obvious once you start thinking about it more pragmatically. The conclusion as to the root cause of the housing affordability problem is based on an analysis of the latest Census data on rental payments and family incomes. 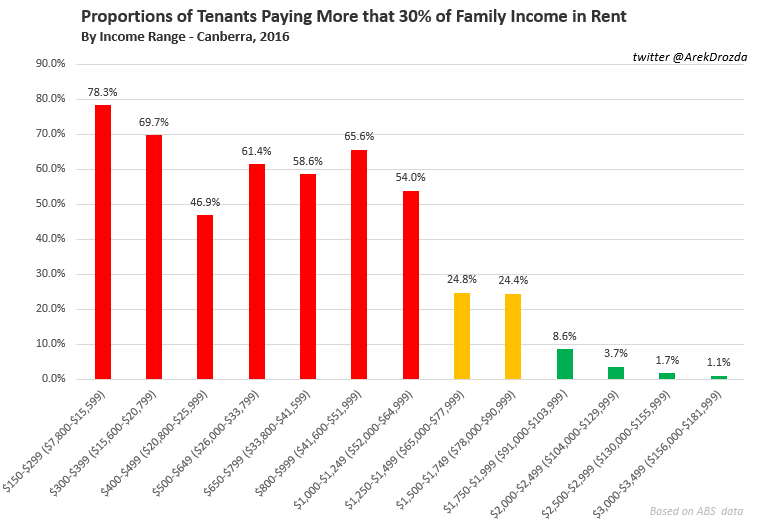 I used only the portion of the data where both rental payments and family incomes could be cross referenced, so covering about 89% of Canberra families in rental accommodation (or 39,810 families out of the total of 44,854 enumerated in rental accommodation in August of 2016). Canberra – rental affordability by income range. Please note, family income ranges are defined by the Australian Bureau of Statistics and are not equal. 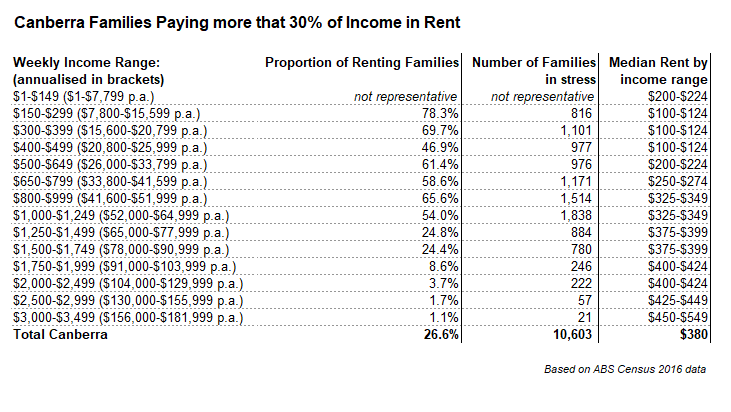 A total of 10,603 families, or 26.6% of all families who rent in Canberra, are paying more than 30% of their income in accommodation expenses and thus can be considered in financial stress (in other words, they are directly affected by the housing affordability issue). It is exactly 6.5% of all Canberra families enumerated in the 2016 Census. Canberra housing affordability by income range. Families with incomes below $65,000 a year appear to be the most affected by housing affordability, while only a quarter of those with incomes between $65,000 and $91,000 p.a. 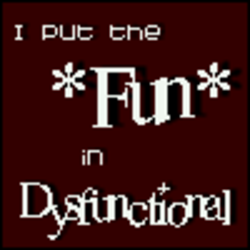 are in the same predicament. The situation improves dramatically for families in higher income brackets. In contrast, in absolute terms, the shortage of affordable rental accommodation in Canberra is only minimal. In particular, if we look at the aggregate numbers of families under a given income level and the total number of rentals provided below the affordability threshold relevant to that income level, the actual shortfall of the cheapest accommodation is no more than 1,500 dwellings (give or take “a few” since this is a less than precise measure and, without the access to individual records in Census survey, it is difficult to draw more specific conclusions). The above data points to only one actual cause of housing affordability: that is, many better-off families are opting to rent housing cheaper than they can actually afford, and therefore, are making less expensive rentals inaccessible for those in lower income brackets and hence in greater need of cheaper accommodation. This should be where the debate on the causes of housing affordability ends. We know there is an issue, what its main cause is and who is most affected. In my next article I will discuss how the issue of inequitable distribution of affordable rentals could be promptly and comprehensively addressed. 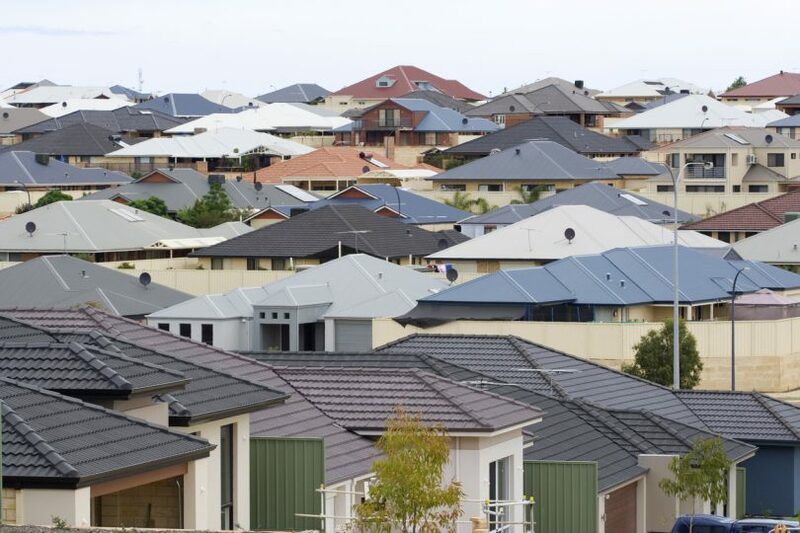 Do you think there really is housing affordability crisis in Canberra or not at all? Do you think it may be a much bigger issue than statistics indicate? I might be missing something but this data doesn’t appear to examine housing affordability. Rather, it appears to examine the proportion of income spent on housing *by those people who can afford to house themselves*. People who truly cannot afford housing – who are homeless or still living with their parents despite being adults – would by definition be excluded from the data? Housing affordability is all about a simple financial/ economic relationship between incomes and the cost of accommodation. Homelessness and living with parents are social issues and in my opinion should be considered separately. A family is defined by the ABS as “two or more persons, one of whom is at least 15 years of age, who are related by blood, marriage (registered or de facto), adoption, step or fostering, and who are usually resident in the same household”. It gets a little bit complicated to generate a very accurate set of numbers. In particular, the above figures exclude single person households in rental accommodation as well but it does not change the overall conclusion. The numbers would simply be slightly greater across the board. Yesterday, the Committee for Economic Development of Australia (CEDA) released its Housing Australia report which focuses on housing affordability. My main criticism is that it is just a rehash of old stories and concepts without much substance. The authors didn’t even try to define what “housing affordability” means and they didn’t size the problem, just launched straight into offering “solutions”. Hi Gail, and thanks for contributing your thoughts. 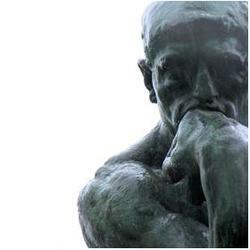 Surprisingly, or not, we are thinking along the same lines. There must be centralised administration to make the distribution more equitable and there must be a subsidy (but not necessarily new money, only redirected resources). The point is that there is already plenty of supply of rental housing at low, affordable price. Another thousand plus dwellings would solve the problem entirely if there is a process in place that ensures only the needy get access to them. The key is how to make it happen quickly and without investing hundreds of $millions… More on this idea next Tuesday. I look forward to seeing how you intend to house a family for $90/wk. How big is that family? I could afford to house them if the rest of Canberra was willing to chip in $260/wk. The cheapest apartment I can find is $210k, and it’s a one bed, one bath, one car place in Hawker with interior decorating straight out of the ’50s. For sale because it is “hard to manage”. At that price it would need a subsidy of $120/wk to make it even remotely attractive to investors. Ideally the subsidy would be paid to the renter, or the renter would pay the ACT Government’s agency who then pays the investor (i.e. : run public housing similarly to DHA). Keeping the investor at arm’s length or further will help keep things cordial. The ACT Government could even use this kind of scheme to help low to middle income investors get a foot up in the market, since a government-backed investment opportunity restricted to investors with under $100k incomes means two groups of people benefit from the program.